Hohe See wind farm will be located in North Sea, 98km offshore the German coast. Image: courtesy of www.siemens.com/press. Siemens will supply and install 71 turbines along with foundations for the Hohe See wind project. Image: courtesy of www.siemens.com/press. The offshore substation contract for Hohe See has been awarded to FICG, a consortium of Cofely Fabricom, Iemants and CG. Hohe See is a 497MW offshore wind farm being constructed in the German North Sea waters. The project was proposed by German utility, EnBW Energie Baden-Württemberg (EnBW), which took the final investment decision on the project at the end of 2016. The project achieved financial closure on 17 February 2017 and is expected to be operational by the end of 2019. It is expected to generate approximately two billion kilowatt-hours of renewable electricity a year, which will be sufficient to power 560,000 homes and will offset 1.5 million tonnes (Mt) of carbon dioxide (CO2) emissions a year. Hohe See will be located approximately 98km offshore the German coast and 90km north of Borkum island, in the exclusive economic zone of the North Sea. The project site covers an area of roughly 42km². The water depth at the site is up to 40m. The wind farm will feature 71 Siemens SWT-7.0-154 turbines rated at 7MW each. The SWT-7.0-154 turbine has a rotor diameter of 154m, hub height of 105m, and a height of 182m to blade tip. Each turbine tower, including the nacelle and rotor blades, weighs 755t. The rotors cover an area of 18,630m², which is the equivalent of 2.6 football pitches. The turbines will be anchored into the seabed using monopile foundations. "Hohe See will be located approximately 98km offshore the German coast and 90km north of Borkum island, in the exclusive economic zone of the North Sea." The design phase of the offshore wind project, which began in February 2016, included the design of monopile foundation structures, layout of the inter-array cabling, and equipment for the substation. The monopiles will measure approximately 70m-long and weigh 1,500t each, while the transition pieces will be approximately 30m-long each. The substation will feature a semi-open topside steel structure resting on a jacket foundation weighing approximately 3,100t. The 33kV inter-array cabling will be roughly 100km-long in total. Siemens will manufacture the turbines at its plant in Cuxhaven starting in mid-2018, while the blades will be manufactured at its plants in the UK and Denmark. The turbines will be shipped in early-2019 for installation at the project site. Commissioning is expected to begin in the third quarter of 2019. The wind farm will be connected to the German grid via the BorWin3 platform, which is a high-voltage direct current (HVDC) grid connection system, and the BorWin Gamma converter platform. 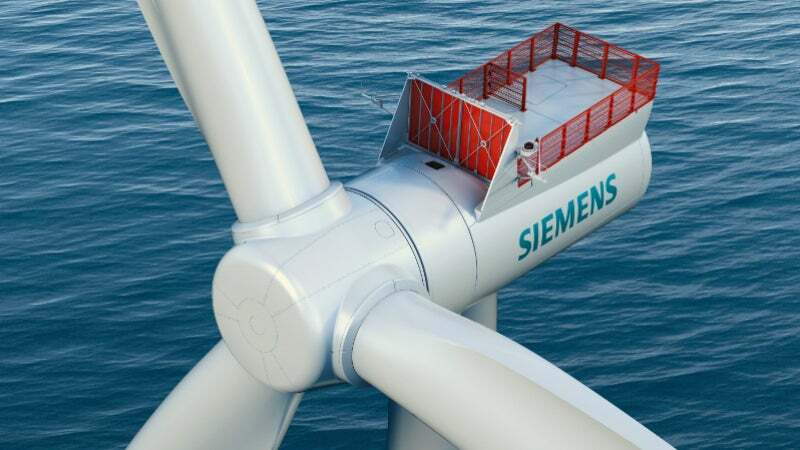 Siemens was awarded the contract to supply turbines and foundations for the offshore wind farm. Deme Group subsidiary GeoSeaof will design, manufacture and install the foundations, along with transition pieces, as an engineering, procurement, construction and installation (EPCI) partner to Siemens. Siemens will also be responsible to provide service and maintenance for the turbines for a period of five years following the project commissioning. GeoSea further subcontracted Netherlands-based Sif Holding for producing the monopile foundations. Sif will also produce the transition pieces in joint venture with Smulders, under the subcontract. The primary steel will be produced by Sif, while Smulders will produce the secondary steel and outfit the transition pieces, under the JV. Fabrication will be done in 2017, followed by installation in 2018. The FICG consortium comprising Cofely Fabricom, Iemants and CG was contracted in March 2016 to design, supply and install the offshore substation. Cofely Fabricom will undertake the engineering, procurement, construction and commissioning of the offshore substation’s topside and jackets, as well as the low-voltage auxiliaries. CG will design, manufacture, install and commission the high / medium-voltage equipment, and control and protection systems for the platform, while Iemants will design and construct the steel superstructure for the topside and foundation. Boskalis’ subsidiary VBMS was contracted for the inter-array cables for interconnecting the turbines. VBMS will supply and install 79 cables under the contract. The contractual scope includes supply, installation, burial, termination and testing of the cables. ZTT was awarded a contract to construct the 155kV HVAC-grid connection for the new offshore wind farm. The company is also responsible to supply shunt reactors, GIS terminal and land conversion joints. The MonobaseWind gravity base has been designed to offer a cost-effective and versatile foundation system for offshore wind turbines. Its main feature is an innovative installation system to transport the foundation with the wind turbine in one operation to the installation site and install it on the seabed.